Racing sailors the world over consider Tuff Luff the only real choice in performance headstay systems. The proven concept is used in everything from one-design to the America's Cup, Admirals Cup, Volvo and all the other grnad prix regattas. the worlds most competitive sailors know there is simply no substitues for Tuff Luff. 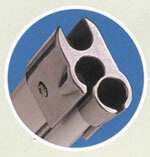 Precision engineering feeders, made of high quality 316 Stainless Steel, fit neatly over the finished Tuff Luff foil. The feeder guides the sail luff into the extrusion for a flawless hoist every time. Made of tough Stainless Steel. 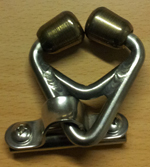 Top caps safeguard against chafe caused by crossed or improperly lead halyards. top cap is aerodynamic and extremely light to minimize weight aloft. it installs in minutes. Oversized sillicon bronze rollers smooth out the sailon its way to the feeder, assuring a perfect set and eliminating the need for crew to hand-feed sail. Protect your Tuff Luff Extrusion from spinnaker pole impacts and sheet chaffing. 4-foot long kevalar bumper is easily installed using adhesive supplied. fits 1205, 1706, 2206 and 3007 systems. Spare feeder screws which fits TL-1205, TL-1706 and TL-2206 systems. Optional prefeeder for Mainsail not included in the complete systems. Oversized silicon bronze rollers, smooth out the sail on its way to the feeder, assuring a perfect set and eliminating the need for crew to hand-feed the sail.